Wacky Watercooler Blog Hop – Christmas in July & More! 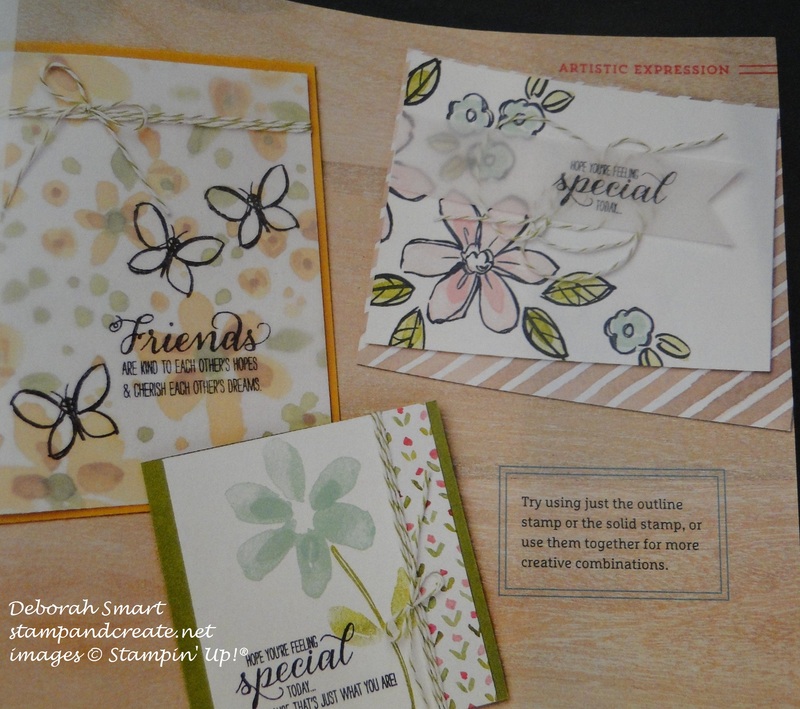 Welcome, stamping friends, to another wonderful, wacky and creative blog hop with the Wacky Watercooler gang! This month, we’ve set ourselves 3 goals: 1st, to create a project with a Christmas in July theme; 2nd to CASE the catalogue, and 3rd, to use one of the new punches. Fun, fun, fun!! I love a challenge, and these were great! Before I show you my projects, I just wanted to remind you that the blog hop runs in a circle; all of our blogs are linked together for the hop, so as long as you keep clicking in one direction, (either next or back) you will be taken through all of the participating blogs. If you prefer to jump merrily about, you can always click on the ‘home’ button – there you will see the list of participants, and click on the blog links from there. Okay – if you’ve come here by clicking the ‘next’ button, then you’ve just seen the amazing projects of Gail Allen. Isn’t she fabulous?! So creative… 🙂 If you’ve been traveling backwards, then you’re here by way of Marie Green’s Tanglewood Cottage; I know you enjoyed Marie’s projects – she never disappoints! I think this card is such fun! The Merry Moments Designer Series Paper really set the stage for this card – I love the big dots in the cheerful colours. The Festival of Trees set and matching Tree Punch were my next choice; I was thrilled to see that these carried over from last year! 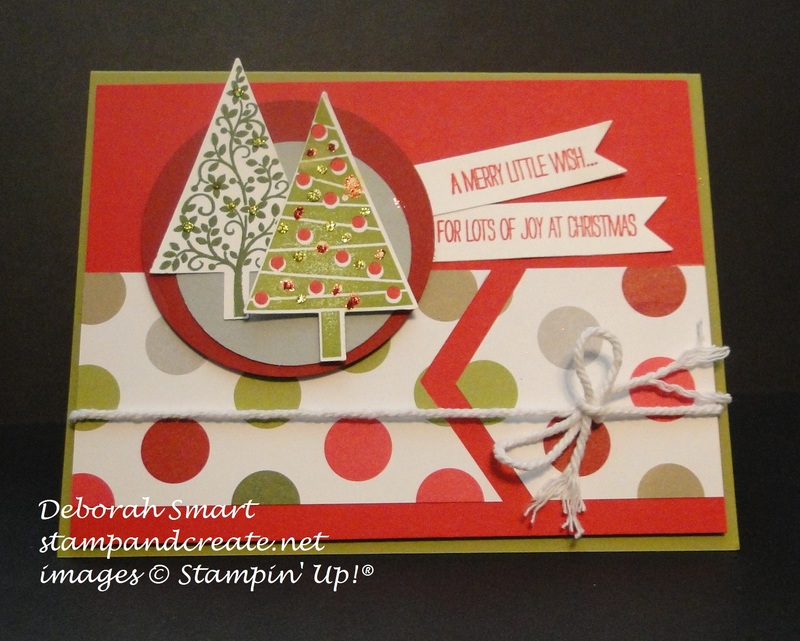 I started with a panel of Real Red cardstock, and then a 2″ strip of Merry Moments DSP. I used the Banner Triple Punch for one end of the DSP, then I just traced the punched shape for the other end, and glued them down to the Real Red cardstock. I then punched 2 circles, using the 2″ and 2 3/4″ Circle punches, from Cherry Cobbler and Smoky Slate cardstock, and layered them together (yes, I layered them like that on purpose!). Onto Whisper White cardstock I stamped the 2 tree images; the back one in Mossy Meadow, and the front one in Old Olive. I used the Tree Punch to cut them out – I do like my life made easy! On the Old Olive tree, I then used the 2-step bauble image to stamp the baubles in Real Red onto the tree. I decided to add some Cherry Cobbler and Gold Glitz Dazzling Details, and Gold Glitz DD onto the background tree. I layered the circles and trees together, then attached them to the Real Red panel. I wrapped a strand of retired thick White Baker’s twine around the bottom, and tied a bow. The sentiments are also from the Festival of Trees set; I stamped them in Real Red onto Whisper White cardstock, and used the Big Shot and Bitty Banners Framelits to cut them out. Yes – I chose the card in the upper right hand corner – but of course I had to make it my own! This stamp set will make you look like a watercolour master! And all without lifting an Aqua Painter or Blender Pen! I decided to start with a card base of Soft Suede cardstock. I then added a piece of the English Garden Designer Series Paper – even it looks watercoloured! On a panel of Whisper White, I first stamped the outline images of the large and small flowers, and small leaves, in Memento Black ink. 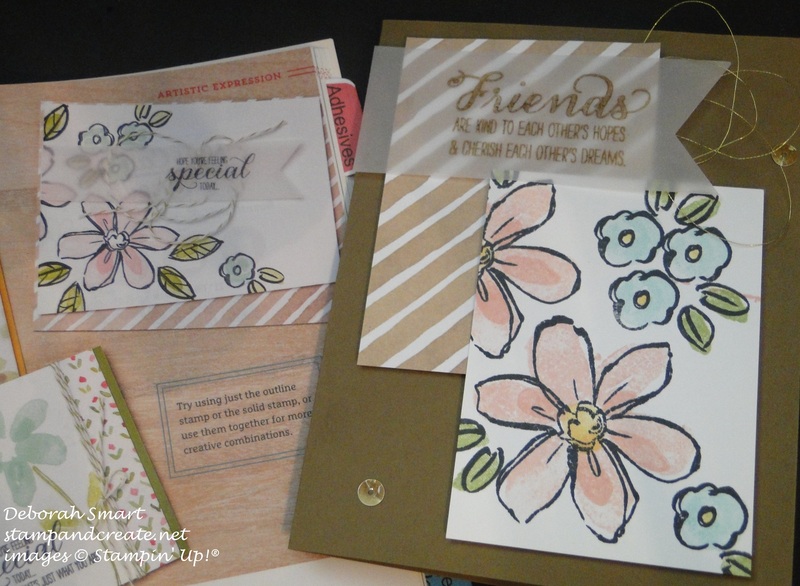 For the large flowers, I stamped the full background in Blushing Bride, stamping off once, first. For the inner shading, I stamped with Blushing Bride again, this time full strength. The smaller flowers were stamped using Pool Party ink; the leaves were stamped in Old Olive ink. The centres of each flower were coloured with So Saffron ink; I thought it kept to the softness of the other colours, rather than the brightness of say, Daffodil Delight. Now the last challenge was to use one of the new punches in the catalogue. Well, I guess I could say I already did that, since I used the Banner Triple punch on the first card – but that would be no fun!! So I decided to make another card, featuring the Tree Builder punch. 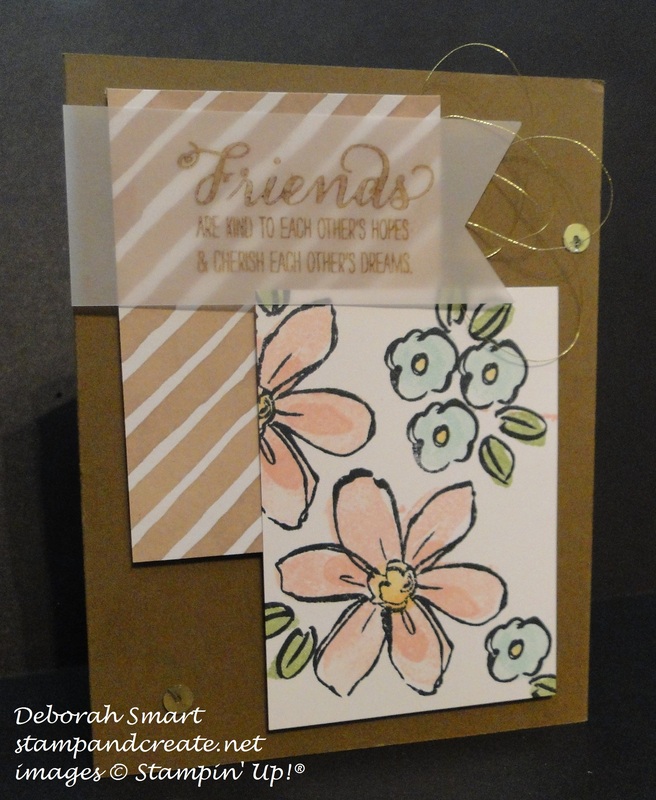 My card base is Hello Honey cardstock; I randomly stamped the small leaf images on it in Tangelo Twist ink. On a panel of Very Vanilla cardstock, I stamped 2 of the tree trunks in Crumb Cake ink. To colour the leaves, I used my Sponge Daubers and Mossy Meadow, Tangelo Twist and Hello Honey and daubed the 3 colours onto the stamp – that way I (hope) achieved the look of the leaves changing colours. For the focal tree, I stamped the trunk in Soft Suede ink, and repeated the colours for the leaves, but this time I used the Tree Builder Punch to punch out each piece, and layer them in the foreground. I then used the same daubing technique for the small leaf images, and scattered them across the bottom of the card. I layered the Very Vanilla stamped panel onto an offset panel of Tangelo Twist cardstock, then wrapped the Gold Metallic Thread several times around the left side, and tied it off with a knot. I decided to not put a sentiment onto the front of the card; I think it can be used that way, or I when I decide to send this card, I can choose a suitable sentiment then. That’s it – those are my 3 projects! I hope you enjoyed them – if you have time, I’d love it if you leave a comment for me! 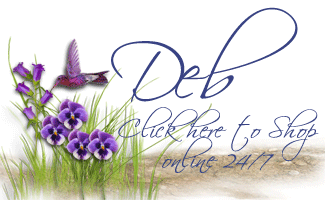 Now, to continue on the blog hop you can click the ‘Next’ button to see Marie Green’s wonderful creations, or click the ‘Previous’ button to head backwards for a look at Gail Allen’s marvelous projects! Your Christmas in July card is so festive and fun! Love the colors. I really love the Garden in Bloom stamp set. I just got it and can’t wait to play with it. I have to agree with Buff, I like your card better than the one in the catalog! 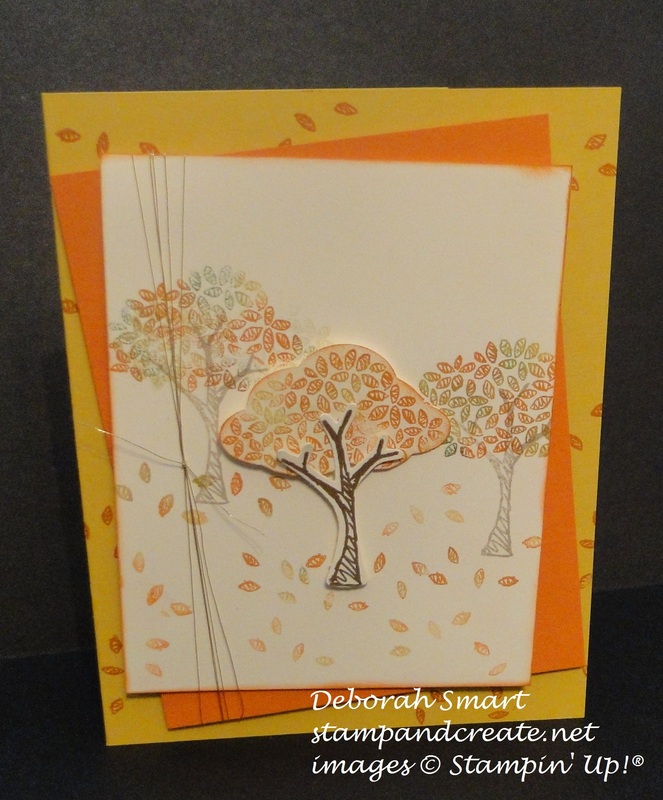 Thank you for sharing your fall card, it’s awesome! All three projects are so lovely. Like you Deb I was happy to see the Festival of Trees and the Tree Punch carry over to the new catalogue, and I love how it comes together in your Christmas themed card with the beautiful dsp. I’m also a big fan of your punch card. I really like how you layered the trees. With all the leaves falling from our local trees it does look a bit like fall, so I can see why you chose to do a fall card. Awesome. Deborah, great projects! I really like the sprinkles of life project! !